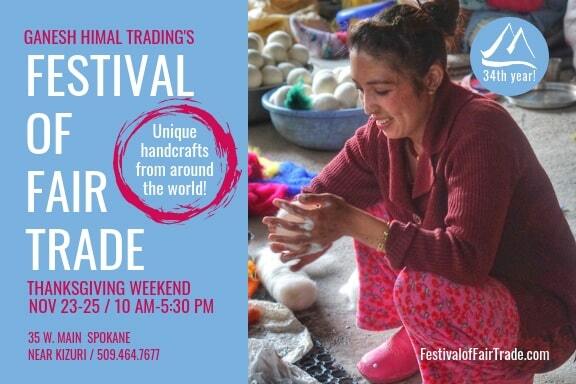 It’s time for the 34rd annual Festival of Fair Trade celebrating artisans from around the world, including Nepal, Mexico, Chile, Guatemala and more. This annual tradition brings a beautiful world marketplace to Spokane over the Thanksgiving weekend. Shoppers can support local importers who pay artisans fair wages & enjoy the chance to purchase gifts while making a positive difference in the world! A unique assortment of handmade jewelry, clothing, handbags, carpets, scarves and gifts will be for sale Friday, Saturday & Sunday, November 23-25th from 10 am to 5:30 pm in the Community Building at 35 W. Main in Spokane.